The history of chocolate follows an incredibly interesting trajectory marked repeatedly by cultural adaptation. This hybridization affects all aspects of chocolate: how it’s made, perceived, how it tastes and how it affects the body. The very word for chocolate has been adapted with time to suit cultural norms. Chocolate consumption originated with peoples before the Maya civilization and was, at first hesitantly, adopted into European culture to then become the sweet, incredibly popular and ubiquitous product that we know today. Chocolate that is enjoyed today is necessarily a mix of the original cacao processing techniques of the Mesoamerican populations, new sweeteners added by Europeans, and the affects of mass production. The Aztecs prepared cacao with maize, chili powder, achiote, “ear flower” (hueinacaztli) and many other flowers and spices (Coe 86-87). They had many variations on the drink, “rang many more changes on the chocolate theme than do we, who are so indissolubly tied to drinks that are sweet” (Coe 94). The arrival of conquistadors to Mesoamerica not only allowed for the hybridization of cacao into a sweetened version to appeal to the European sweet tooth, but also brought European food staples into the diet of the natives. One unique combination that arose from the convergence of Spanish and native Mesoamericans and their dissimilar diets was the consumption of chocolate with cheese. Spaniards were accustomed to a high fat, starchy diet: “the Iberian cuisine was heavily weighted toward meat and starch, as it is today, with an emphasis on frying with lard and olive oil” (Coe 112). The Spaniards thus began importing livestock to produce meat, and importantly for this discussion, cheese, for “cheese was totally absent from the native table” (Coe 112). The hybridization, or creolization, that began to unfold went both ways. The Spanish relinquished some focus on wheat to include maize in their diet. Similarly, native populations began consuming meat and cheese. In fact, “an entirely new, creolized culture was taking form that partook of elements from both culture…” (Coe 113). As cacao colonies were established in South America, chocolate and cheese became a dietary staple there. In present day, this practice survives in Venezuela, Colombia, and Ecuador (Alarcon). A nineteenth-century German traveler recorded “…how peasants in the Venezuelan Andes would take chocolate at three o’clock in the afternoon together with a fresh cheese called queso de mano.” Maricel Presilla recounts a traditional practice in the Columbian Andes of dunking salty cheese into hot chocolate and scooping out the softened cheese to eat. She also notes that “chocolate is traditionally accompanied by cheese arepas” and includes recipes for these two Columbian dishes (Presilla 29). Lastly “chocolate and cheese were also a usual part of dessert” (Presilla 30). Popular media has also published similar recipes incredibly recently. Just one week ago (February 10, 2015), the Boston Globe published “Pour this Venezuelan hot chocolate over queso blanco,” telling the story of traditional Aztec chocolate drinks and the arrival of cheese to the Americas with the Spaniards. 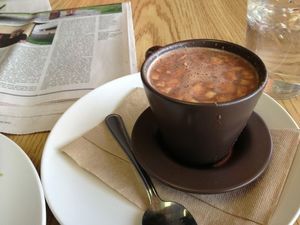 The story continues to promote La Casa de Pedro, a traditional Venezuelan restaurant (in Watertown MA) that serves a hot chocolate with softened cheese. The author, Rachel Ellner, quotes Presilla on this tradition, its history, and its continued existence (Ellner). The Boston Globe also published a recipe adapted from La Casa de Pedro’s very own Pedro Alarcon (Alarcon). The recipe is very similar in spirit to that published by Presilla but without mint or cinnamon flavorings that Presilla includes and of course substituting Colombian chocolate for Venezuelan. Rob Thomas of the Wisconsin State Journal also recently reviewed La Taguara, a Venezuelan restaurant in Madison Wisconsin. He jokes that hot chocolate and cheese could have been invented in Wisconsin (a state with cold winters and also known for its cheese). Overall, he’s not impressed with his hot chocolate and cheese experience, but he’s open to trying it again, perhaps if the “beverage [is] hot enough that the cheese melts at least partially, making for a smoother flavor” (Thomas). The eating of chocolate with cheese has become a celebrated part of Venezuelan and Colombian diets and is a derivative of the creolization between native Mesoamerican food culture and the conquering Spanish. Alarcon, Pedro. “Recipe for Venezuelan Hot Chocolate.” BostonGlobe.com. The Boston Globe, 11 Feb. 2015. Web. 15 Feb. 2015. Coe, Sophie D., and Michael D. Coe. The True History of Chocolate. 3rd edition. London: Thames & Hudson. 2013. Print. Ellner, Rachel. “Pour This Venezuelan Hot Chocolate over Queso Blanco.” BostonGlobe.com. The Boston Glove, 10 Feb. 2015. Web. 15 Feb. 2015. Presilla, Maricel. The New Taste of Chocolate, Revised: A Cultural & Natural History of Cacao with Recipes. Berkeley: Ten Speed Press, 2009. Print.